DOUG AITKEN GREW UP IN LOS ANGELES. Two high-res movie cameras and a boom mic zero in on the two members of Lucky Dragons, who are propped in a Formica booth inside the Skyline Drive-In’s concession stand. The ubiquitous Content Team hovers around them, adjusting LED lighting panels and trying dolly shots. The video is more than documentation, more than just blogging. It could be the final and most permanent form of Aitken’s Station to Station, a self-described nomadic, public art and music festival spanning three weeks and ten American cities, rolling by train, east to west. The Content Team, as much or more than the artists and musicians, churns out product with abandon, like latter-day Merry Pranksters littering the country with footage—more gigabytes than will ever be recovered, let alone watched. Which comes first: the Experience or the Movie? Left: A mural in downtown Barstow, California. Right: Miss Barstow 2012 Charli Burnett. Wandering up and down Barstow’s shadeless sidewalks, you could kind of spot the S2S personnel. Two folks from the Levi’s media wing were roaming town with a vintage Polaroid camera, looking for “interesting characters.” A kid in a baseball cap and plaid shirt, which is open except for the bottom button, offers to pose—for ten bucks. “Oh, no thanks…” But he’s just playing, just messing with you. But he’s walked off. Barstow is caught in the confluence of the I-15 and I-40 freeways, straddles Route 66, but was founded as a water stop for steam engines. Folks here serve in the military, railroad, and service industries, in that order. It’s a transient population. Barstow Station is a combination McDonald’s, Panda Express, gift shop, and liquor store built in 1973 to serve tour bus passengers. It’s made of seventeen junked rail cars. The men’s restroom is a caboose. That evening, across town at the Amtrak station, the Los Angeles Times’s Deborah Vankin and I met Adam Auxier, Train Producer. He’d been contracted to supply the private train, provide the crew, and liaison with Amtrak. Long strips of LEDs—a piece by Doug Aitken—ran along one side of each car. The blinking, glowing locomotive drew a few curious onlookers—but how to explain? It’s art—but there’s not so much art in the train as on, or near it. But we can’t really give you a tour… The Happening is tomorrow at the Drive-In, but—it’s sold out… And—and everyone is confused by this—the train will be nowhere in sight. A few of the train’s ten crew members were grilling flank steak on a Weber on the non-LED side of the platform. All the artists, though, were nestling into their hotels by then. People worked hard. Sleep to catch up on. Blogs to write. “It’s not a shitshow,” said Auxier. Left: Backstage at the Barstow Happening. Right: Train producer Adam Auxier. The 1970 Festival Express, featuring Janis Joplin, the Band, the Dead, et al, was waylaid at every stop by riots over ticket prices, i.e., Music/Art should be free, man. (And don’t we still kind of feel that way?) A ticket to a Station to Station Happening cost $25, no matter what city, no matter which acts: Jackson Browne or Beck. That’s pricey for an art show most places, but cheap for a festival. Levi’s bankrolled S2S almost entirely (and if you have to ask how much it takes to rent a train, let alone move it someplace), while minor sponsors provided gear and consumables. All ticket sales benefited a Cultural Fund for experimental programming at nine Cultural Partner institutions. Accordingly, while they technically had no content control, denim-clad Levi‘s people were a major presence. Leave it to those Levi’s guys to claim Manifest Destiny, to make Industry chic, to own Wide-Open Spaces, in a way that made Station's vague Americana- and train-themed art seem out of touch. Here and there on the dust and gravel of the Skyline Drive-In was an art crate with an artist-designed poster on it (YOU ARE ON INDIAN LAND / SHOW SOME RESPECT, said Sam Durant’s), or a hired hand buffing the Levi’s Airstream to an unreal shine, or artist assistants Windexing the mirrors of the Nomadic Art Structure (it’s a yurt) by Urs Fischer. There were three of five artist yurts being readied in Barstow, although none were scheduled to appear. The two Nomadic Levi’s Structures were proceeding as planned. Left: Sara Rara and Luke Fischbeck of Lucky Dragons in the Recording Car with producer Justin Stanley. Right: Beck with Fred Martin and his choir at the Barstow Happening. As night fell, around a thousand paying customers strolled over the berms of the drive-in. A pair of ORV’s perched on the nearby ridge. Bands played short sets, intercut with video art and performances. Fischli & Weiss's sprawling The Way Things Go was trimmed to three kinetic transfers. A whip cracker snicked out a rhythm and an auctioneer barked numbers while a woman sang. Locals watched as photos by Stephen Shore of a desertified town (their own) flashed onto a giant screen from a projector on a scissor lift. The image wobbled in the breeze. Then a gospel choir took a lap through the audience then up on stage with—Beck, yes—backed by Fred Martin and the Levite Camp choir as he played foxcall harmonica for “One Foot in the Grave.” Bifurcated train footage behind him provided weakly trippy visuals. “The train’s on the track. / You can’t hold the train back.” Beck riffed on the train, the desert, the atmosphere, and on designer jeans; a list of the Authentic. “Well there’s a hole in this world.” The space between worlds persisted, though. “You can’t fill it alone.” The night was too wide open. Then again, it’s possible to just enjoy things, right? Like the surprise UFO by Peter Coffin, slowly buzzing the crowd—clearly a disc of rigging covered in LEDs—to suspend disbelief, as if from the proverbial helicopter. Beck couldn’t resist. He kept bantering about it. “I think we’re being visited by life forms from another galaxy,” he drawled. “Maybe that’s my ride home.” Then, “Two turntables and a UFO.” After the show the stage transformed into a truck and rolled away. Artist Tim Davis and journalist Joe Hagan. You didn’t have to be rich to ride, or connected, but it helped to know someone who was. Press, media team, friends of artists, friends of crew made up the manifest. A surprising number of folks seemed to have no music to play, no story to file—only experiences to experience. Do you consider yourself a utopian? The Allan Kaprow Happenings were small and ephemeral, whereas even the train doors are two inches thick and metal. Sure enough, the Recording Car, while I was there, hosted two bands—Cold Cave and Lucky Dragons—but at two times, they didn’t jam, and LD seemed almost coerced into going “down there,” like kids placed in a room full of expensive toys while the adults watched. They don’t normally “noodle around,” either, so they made a field recording of the train between cars, clacking, rhythmic, then shifted the sample, sprinkling round warpy synth with metallic creaks. Cold Cave reportedly also sampled the train. After all, as crew kept reminding me, blues ain’t nothing but the four-four time of a steam engine’s four-stroke cycle. More than the Happenings, and probably more than Aitken’s eventual video, Station to Station was about Train Time: where a hand-picked cast of makers and doers were a community, where a ticketed high-budget spectacle was a public art festival, where a meticulously routed thousand-ton train was nomadic, where corporate underwriting was benevolent and necessary and divorced from content. The train contained its own relativity. 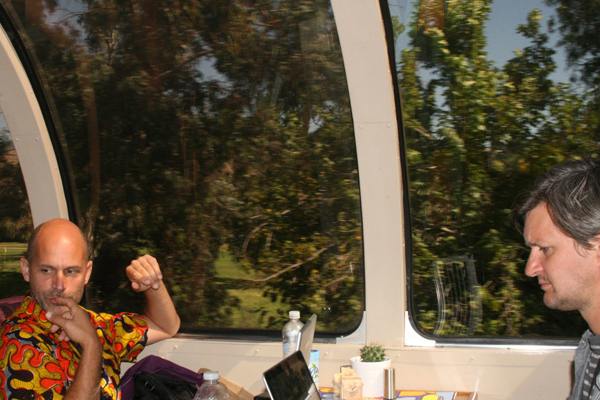 Artist Liz Glynn, the LA Weekly’s Catherine Wagley, and I glided through the Amtrak yard and into Los Angeles’s Union Station in the “Sinatra Car”—a Skytop Lounge caboose by Brooks Stevens, the industrial designer that pioneered planned obsolescence. It’s only two hours from Barstow to Los Angeles, but on the train it took six. Left: Peter Coffin's UFO visits Barstow. Right: Artist Liz Glynn in her Station to Station studio. 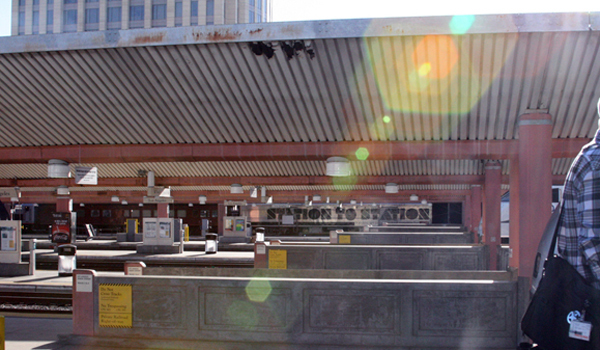 On one side of the Union Station concourse, the main stage was set up in the old Ticket Lobby; across the bustling main waiting hall the yurts and bars were clumped together in a courtyard, and beyond that was a big bar that, like Barstow Amtrak’s Casa del Desierto, like most of Station’s nine stops, was once a Harvey House—restaurant-and-hotel combos built along the Santa Fe Railroad: the country’s first food chain. The Carsten Höller yurt had some pole problems, but Liz Glynn’s was there. A docent handed me a headlamp. I entered a black spiraling space subdivided by industrial felt walls, graffitied with cryptic chalked phrases, like: THIS IS WHY WE CANNOT PREDICT THE FUTURE. Behind a heavy curtain in a felt alcove was Glynn, red headlamp beaming, wrapped in a felt shawl. The S2S Los Angeles afterparty was supposed to be held on the train, but was canceled for Security Reasons. The Levi’s party was at the Standard Hotel downtown. Blacklights electrified five Ping-Pong tables, nets and balls, everyone’s dandruff, the washes of folks’ jeans. At some point somebody rolled back a wall and revealed eight more tables. The Station to Station Express at Union Station, Los Angeles. The next morning, Friday, I went to Track 13 at Union Station to see the train off. After the cars reached Oakland, discharged their Station to Station passengers and cargo, they would go their separate ways—most up to Seattle, the rest back to Minneapolis by way of Chicago on the back of the California Zephyr, chartered by another client. I had some idea of a big closing shot, a photo of the train’s orange Hiawatha Skytop smudging north across the frame—but that didn't work out, the train looked still, a video would have been better.